With the extraordinary Cruz vs Trump battle for the GOP presidential nomination sucking up all of the political oxygen, it is easy to miss that awesome conservative retired Air Force Col Rob Maness is running for the U.S. Senate in Louisiana. Folks, please allow me to cut to the chase. Our country is going to hell in a hand basket fueled by GOP cowardice and an entire Democrat party hijacked by anti-American zealots. The only way we stop the horrific effects of Obama's insanity and corruption in both parties is to send rock-solid conservatives we can trust to Washington; candidates with backbones-of-steel who refuse to go-a-long to get-a-long. Speaking of backbone, Maness's military awards and combat decorations include the Legion of Merit, the Bronze Star and Air Medal. I am pretty sure Maness will not be intimidated by RINOs, metro-sexual democrats or Obama bureaucratic henchmen in DC. Maness is like an oak tree firmly and deeply rooted in the rich fertile soil of his Christian faith. When you cut through all the political deceptions, lies and broken promises, it always comes down to sending character-driven representatives to Washington. Rob Maness' record proves he fits the bill. In plain language, Maness is one of us folks; a real family, God and country good guy. 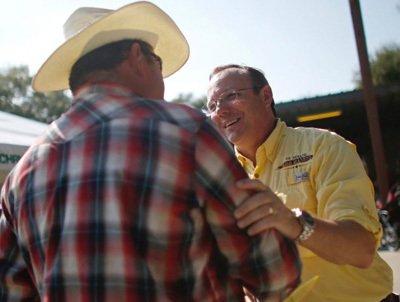 It is not surprising that national conservative heavyweights and organizations are united in endorsing Rob Maness for U.S. Senate, Louisiana. Those supporting Maness include Dr Ben Carson, Sarah Palin, Dr James Dobson, Lt. Governor Billy Nungesser, Conservative Campaign Committee, Tea Party of Louisiana, Tea Party Nation, Tea Party Forward, the National Association for Gun Rights and Special Operations Speaks. C'mon folks, admit it. Isn't Maness's manly stand-up for America leadership a refreshing contrast to Obama and Kerry's apologize-for-our-very-existence and give-our-enemies-everything-they-want approach? By the way, the Islamic terrorist attacks in Brussels hit a little too close to home for the Maness family. The night before the attacks, Rob and Candy's son flew out of Europe on military leave on an American Airline flight. According to a new Pew Research report, our country is undergoing a scary demographic shift. http://pewrsr.ch/1RNzWzs Decades of allowing liberals to brainwash our kids and not encouraging immigrants to assimilate is taking America down a different path far away from the country envisioned by our Founding Fathers.